Not sure which class is right for you little swimmer? Click on the link below. The Program Overview will show you what students will do in each class and what the intended outcome of the class will be. The Stages of Learning give you more definition of what they do in classes. Registration is open for the next session of swim lessons. This 5-week session will begin on April 23rd and run through May 25th. Classes and times offered can all be found on the link below. 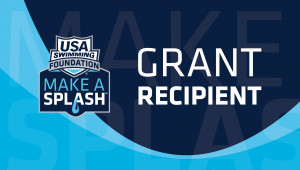 For more information on USA Swimming Foundation/Make a Splash Program, click on the picture above. B) Water Exploration – Focuses on exploring body positions, blowing bubbles and fundamental safety and aquatic skills. Outcomes: Accompanied by a parent, infants and toddlers learn to be comfortable in the water and develop swim readiness skills through fun and confidence-building experiences, while parents learn about water safety, drowning prevention, and the importance of supervision. Water Acclimation – Increases comfort with underwater exploration and introduces basic self-rescue skills performed with assistance. Water Movement – Encourages forward movement in water and basic self-rescue skills performed independently. Water Stamina – Develops intermediate self-rescue skills performed at longer distances than in previous stages. 4. Stroke Introduction – Introduces basic stroke technique in front crawl and back crawl and reinforces water safety through treading water and elementary backstroke. 5. Stroke Development – Introduces breaststroke and butterfly and reinforces water safety through treading water and sidestroke. 6. Stroke mechanics – Refines stroke technique on all major competitive strokes and encourages swimming as part of a healthy lifestyle. Outcomes: Having mastered the fundamentals, students learn additional water safety skills and build stroke technique, developing skills that prevent chronic disease, increase social-emotional and cognitive wellbeing, and foster a lifetime of physical activity. We are once again offering both Lifeguard Certification as well as Lifeguard Recertification classes at the Y! Be able to swim 300 yards, freestyle, breaststroke or a combination of the two, face in the water. Swim 20 yards, surface dive to a depth of 7-10 feet and retrieve a 10 lb. object, return to the surface, swim 20 yards to the starting point with the object and exit the water without using a ladder or steps, within one minute and 40 seconds. Tread water continuously for two minutes unsupported with hands in armpits. Prerequisites must be completed the Friday one week prior to the class. $200 class fee, please make check payable to Beatrice YMCA; $75 will be non-refundable if the participant does not show up. MUST BE A CURRENT LIFEGUARD; bring proof of certification. Be able to swim 300 yards; freestyle, breaststroke or a combination of the two, face in the water. Swim 20 yards, surface dive to a depth of 7-10 feet and retrieve a 10 lb object, return to the surface, swim 20 yards to the starting point with the object and exit the water without using a ladder or steps, within one minute and 40 seconds. Please make checks payable to the Beatrice YMCA $25 is non-refundable. *All class participants MUST attend Friday evening. Only those needing the lifeguard review need to return Saturday morning. The YMCA offers a broad range of instructional programs for people of all ages and ability levels. Peer grouping. Children learn better when they are grouped by age as well as ability. The fact that children have school or hobbies in common enhances group rapport. Closed-end classes. YMCAs maintain classes at a fixed ratio of participants to instructors. The number of class periods is set at the beginning, and each class session has a distinct beginning and end. Use of instructional flotation devices. Instructional flotation devices, when used properly, aid skill development. Such devices free swimmers from worrying about staying afloat so they can concentrate on learning new skills and build strength and endurance. The devices should be used only for teaching purposes and should not be worn throughout an entire class period. At the Y, it’s never too late to learn to swim. We offer swim lessons (for all ages), family, swim, and competitive swimming. Did you know that swimming is a great way to get physical activity? Swimming is a life-long skill with many health benefits that helps people stay active, be healthy and have fun together or by themselves. As part of the Y’s commitment to keep swimmers safe in and around the water, the Y encourages children and adults to have fun and enjoy the various benefits of swimming, but to always make safety their first priority. A pioneer in swimming for more than 120 years, the Y’s programs include swim lesson, water exercise and aerobics, competitive swimming and rehabilitation programs – all emphasizing sportsmanship, fostering positive, relationships and celebrating achievement. 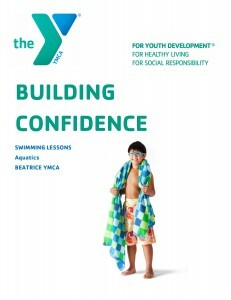 YMCA swim programs teach water safety skills and help participants develop confidence in and around the water. They also offer swimmers the opportunity to enjoy water sports, enhance or learn new swim techniques and meet new friends. There is a place for everyone at the Y – anyone at any skill level can take swimming lessons. It is never too late to learn how to swim and to enjoy the water. Individuals requesting private and semi-private lessons may or may not be members of the YMCA. Participants may choose private (one person) or semi-private (2-3 person) lessons. The additional persons must be provided by you in the semi-private lessons. We offer a five-lesson package. The Aquatics Department will work closely with you to arrange for an instructor geared to the participant’s needs and create a mutually convenient schedule. The lessons are 30 minutes in length. Participants may request a specific instructor. If that instructor is not available another instructor will be assigned. All registrations must be accompanied by payment in full prior to first lesson. Participants of this program do not have exclusive use of pool. Other programs or other private lessons may be scheduled simultaneously. We cannot schedule private lessons during our prime time when pool space and our instructors are already busy. Due to large volume of private swim lesson requests, it may be necessary to enter your name on our waiting list. TOT DOCK FOR SAFETY: an underwater platform that enhances student confidence and security by reducing water depth and providing a railing to hold onto. The Beatrice YMCA Special Olympic Swim Team is dedicated to providing all swimmers in the Gage County area a positive and healthy level swimming experience. We are proud of the coaches and we offer the levels of training to meet the individual needs of our swimmers. As a YMCA program, we challenge all persons involved in the swim team program to demonstrate the YMCA core values: caring, honesty, respect and responsibility. As well as the Special Olympics mission providing opportunities to develop physical fitness, demonstrate courage, experience joy and participate in a sharing of gifts, skills and friendships with their families, other Special Olympic athletes, and the community. To be eligible to participate, children must be 8 years old and identified by an agency or professional as to having one of the following: intellectual disabilities, cognitive delays as measured by formal assessment, or significant learning or vocational problems due to cognitive delays that require or have required specially designed instruction. If you like water and can float, swim or walk there is an event for YOU! Participants must be a Y member to participate; membership is in addition to swim team fees. Scholarships are available to everyone! For questions, contact Kim Seggerman at the Y (402-223-5266) or email her at kseggerman@beatriceymca.org.